Camp Shields will be the setting for the 3rd Annual TechNet Day sponsored by the Okinawa Chapter of the Armed Forces Communications and Electronics Association. The day-long event takes place 7 a.m. ~ 4 p.m. October 23rd at the Crow’s Nest Club on Camp Shields. 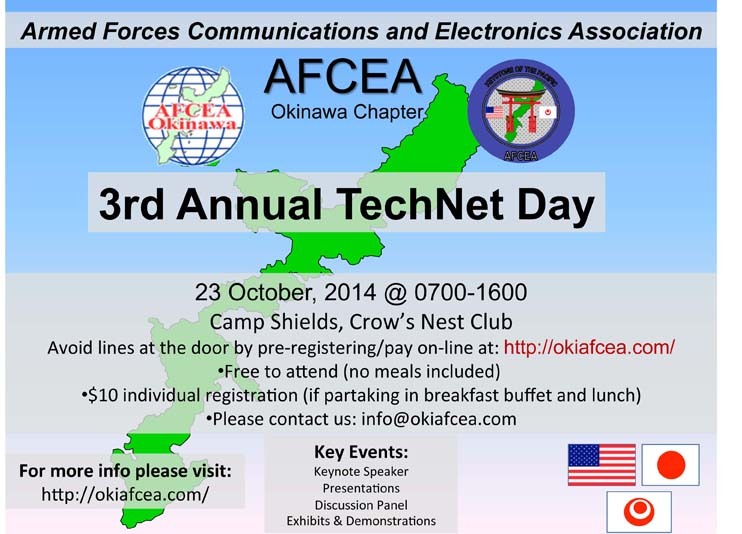 Attendance at the event is free, and pre-registration can be accomplished at http://okiafcea.com. The $10 individual registration fee, is for those who will purchase the breakfast buffet and lunch. The TechNet Day includes presentations, a discussion panel, exhibits and demonstrations, and a keynote speaker.